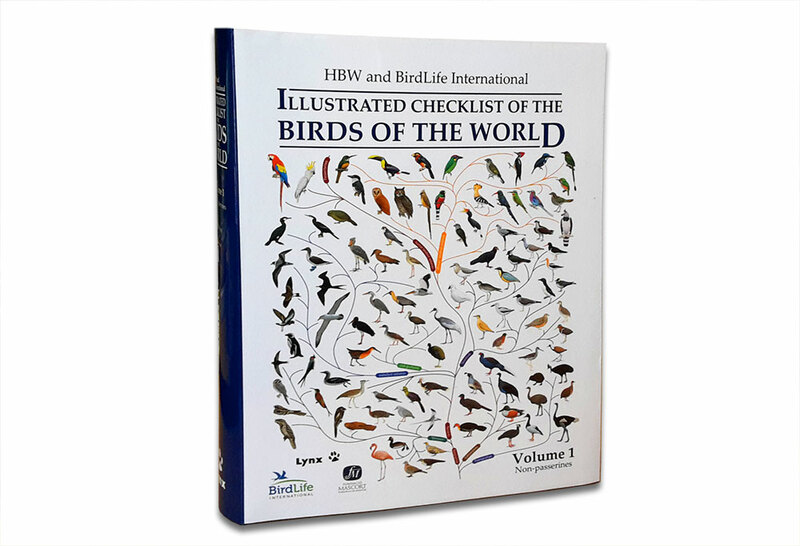 Oh yes…I was telling you about the magical new HBW and BirdLife International Illustrated Checklist of the Birds of the World, published by Lynx Edicions in 2014. In my previous blog post (which you can see here), we explored the question of ‘what is a species?’ and looked at some of the species concepts applied by this ambitious new book, and specifically the application of the so-called Tobias criteria in determining species-level classifications. In this post, I’ll chat a little bit more about the book itself, and whether it’s worth the €185 (approximately R2,600) that it will set you back. I’ll also divulge some of the more juicy splits/lumps, and specifically those that would be of interest to southern African birders (like me). Also, for some reason I decided last time to do a Harry Potter-themed book review. I am not sure how many birders are also fans of JK Rowling’s Potter books, but since I have already committed to that theme, you’ll have to excuse the frequent and often obscure references. Google them if you’re unsure, or ask me in the comments. What is the incantation for cramming 4,549 bird species into one book? Perhaps economicus maximus! Swish and flick. Well, to be fair, the HBW Checklist is a substantial tome, and certainly not something that you could comfortably carry around in the field. The book measures about 310 mm x 240 mm, and is around 50 mm thick, with 904 pages. I haven’t weighed it, but I would imagine it weighs about the same as your average house elf. This is is the first of two volumes: conveniently, the division between the non-passerines and passerines splits the world’s bird diversity in half. This volume includes over 4,500 species. These are depicted on 357 colour plates by some of thew world’s leading bird artists: when comparing my own artwork to these masters’ I am particularly humbled by the work of Ian Lewington, Chris Rose and Hilary Burn. 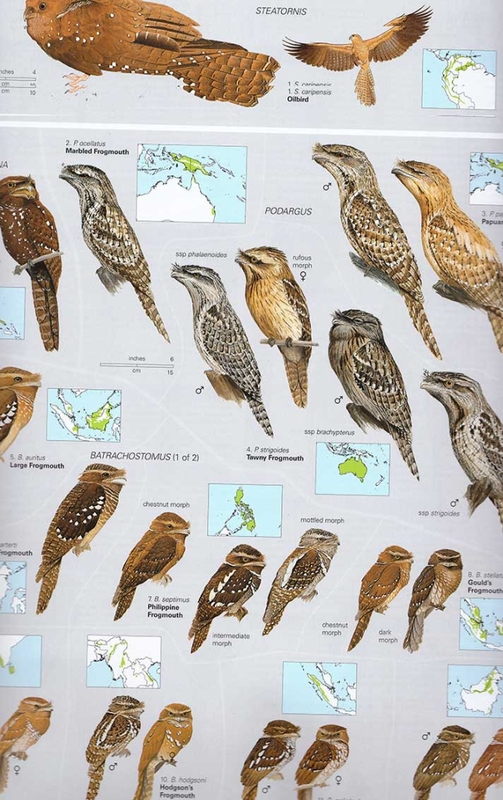 The book includes a staggering 8,290 bird illustrations in total. Each species is accompanied by a colour-coded distribution map (4,428 in total). I think a particularly useful decision was that of including the maps on the plate itself, which makes the maps instantly comparable. While we’re at it, let’s talk about the plates some more. The images are standardized (all looking to the same side, in the same pose) and are placed against a light grey background. Species names, plus subspecies names or gender where applicable, are indicated right on the plate, along with a number in the family (i.e. the genus Oena contains only species, O. capensis, the Namaqua Dove, which is number 197 in the Columbidae family). Species are separated by thin paler lines, and genera by thicker lines. Personally, I would have either made the lines bolder, or just reversed the colours so the birds are on a white background. Another nice touch is the inclusion of occasional subtle scale bars to give you an idea of the scale on each plate. ABOVE: It was hard to choose just one plate as an example to show you the book’s layout. In the end I settled for this one showing the bizarre Oilbird (the world’s only flying, nocturnal, echolocating frugivore), as well as the characterful frogmouth (if you ever meet me in the field, ask me about how I was attacked by a Tawny Frogmouth in Australia’s rainforests one night). Please excuse the strange cropping – my scanner cannot manage an entire page in one go. Note the the subtle white lines between species and genera (plus the thick line separating the Oilbird and frogmouth families). The distribution maps are usefully placed right on the plate. ABOVE: An example of the species texts – in this case pertaining to the smaller korhaans or bustards. Taxonomic notes: Ardea alba Linnaeus, 1758, Europe. Frequently placed in Egretta or in monotypic genus Casmerodius, but DNA analyses indicate closer genetic link with Ardea (1666). Distinctive characters in race modesta score highly against nominate alba and would results in treatment as a full species, but race melanorhynchos is intermediate; all four taxa score fairly highly against each other, and work is needed in order to establish differences in display repertoire during breeding season. Four subspecies recognized. A. a. alba Linnaeus, 1758 – Western Great Egret. C Europe E to C Asia (S to Iran), Russian Far East, NE China (Heilongjiang) and C Japan; winters SC Europe to N & C Africa, and Persian Gulf to S China and Korea. A. a. modesta J. E. Gray, 1831 – Eastern Great Egret. Indian Subcontinent E to SE Asia, SE & E China, S Japan and Korea, S through Sundas, Wallacea and New Guinea region to Australi (except arid interior) and New Zealand. A. a. melanorhynchos Wagler, 1827 – African Great Egret. Africa S of Sahara, Madagascar. A. a. egretta J. F. Gmelin, 1789 – American Great Egret. NW USA and SE Canada S through much of North and Central America and Caribbean to S Chile and SC Argentina (Santa Cruz). The species accounts take up the vast majority of the book (706 of 904 pages). But what about the rest? The team of authors are clearly proud of their extensive 33 page, illustrated introduction, and rightly so. I was so impressed with this readable but scientifically sensible chapter that I immediately grabbed a highlighter and started desecrating the book. I ended up writing a whole blog post summarizing just the introduction chapter (see it here). I was also elated to discover two bulky (frowny face) appendices on Extinct Species. The firest Appendix includes species for which there is at least one specimen in existence, or for which good illustrations or written descriptions are available – these species are accompanied by a rage map and illustration. The second is for taxa that are not typified by an extant specimen – consequently an illustration would have required too much quesswork. Some examples of the first category are the America’s Labrador Duck and Passenger Pigeon, Madagascar’s Alaotra Grebe and Snail-eating Coua. Mauritius’s infamous Dodo and its island-next-door neighbour the Rodrigues Solitaire, the Canarian Oystercatcher, the Tahiti Sandpiper, the Arctic Great Auk and Australia’s Paradise Parrot. Examples in the second category are far more obscure, but include mostly island endemics, especially doves, rallids, owls and parrots. My surprise at discovering “Appendix 3: Reference Maps” bordered on that of Harry when he learned that Professor Lupin was actually a werewolf. Yes, indeed. 34 high quality topographical maps of the world, showing important places names (including e.g. South Africa’s transient provincial boundaries, China’s provinces, South Sudan, most of the more complicated island chains and all major rivers in the Amazon drainage). A book of this caliber, which is essentially a massive literature review, is bound to feature an exhausting bibliography. In this case, 1982 (incidentally, also the year that I was born). References are referenced in the text by small superscripts. The book is concluded by a 65 page index with mixed common, scientific and family names. Volume 2, for a start. The second volume will handle the passerines, and will be slightly bigger (and more expensive) than the non-passerines volume. Volume 2 is expected to drop in 2016, so better start budgeting now. HBW Alive is of course Lynx’s online equivalent of the printed 17-volume Handbook of the Birds of the World series. I have had their Internet Bird Collection site bookmarked for years, and visit it frequently (especially to look at reference video footage). And if you still have some Galleons, Sickles or Knuts in your Gringotts Wizarding Bank account, you could always splurge on the fantastic Handbook of the Mammals of the World. Spoiler Alert! These are some of the lumps and splits (taxonomic, not medical terms) outlined in the book. Do you agree with them? Common Ostrich Struthio camelus is split from Somali Ostrich S. molybdophanes. The latter is monotypic, but Common has three recognized subspecies: S. c. camelus (Sahara, Sahel E to Sudan and Uganda); S. c. massaicus (southern Kenya to Tanzania) and our S. c. australis down south, as well as an extinct race syriacus (Syria and Arabia). The two species are parapatric, with adjacent but not significantly overlapping ranges in Ethiopia and Kenya; they are further distinguished by neck, leg, eye and scute colour among other features. An interesting development here is the splitting of Crested Guineafowl Guttera pucherani into three species. Our South African birds, which also occur in Zimbabwe, Mozambique, Malawi, Zambia and southern Tanzania are forthwith known as Southern Crested Guineafowl G. edouardi (with two races: southern G. e. edouardi, and northern G. e. barbata). This ‘species’ is replaced in northern Tanzania to Somalia by the Eastern Crested Guineafowl G. pucherani. In West Africa, but also ostensibly as far south as western Zambia, the Western Crested Guineafowl G. verreauxi makes an appearance. In retrospect our southern birds do look quite different to their congeners, having dark (vs. blue or red) facial skin, a creamy white skin on the nape, and a brownish collar. As an aside, the good ol’ Helmeted Guineafowl Numida meleagris remains lumped as one species. While I didn’t quickly notice any major changes affecting southern African classifications, it is interesting that the checklist authors reverted back to the name francolin for both the smaller Scleroptila species, as well as the larger Pternistis species (usually called spurfowl in new publications). Red-necked Francolin/Spurfowl P. afer is lumped despite its celebrated variation, although a long discussion on its classification is included. I know a lot of people are hoping for ‘Kirk’s Francolin’ the Mozambique lowlands version of Crested to be split, but I’m afraid they are still firmly lumped under one Dendroperdix species. Another lump is the amalgamation of Orange River Francolins from SW and NE Africa; the latter is sometimes separated as Archer’s Francolin Scleroptila lorti. Essentially this also means southern Africa loses a near-endemic. Note also that the scientific name of Orange River Francolin was changed to S. gutturalis to replace the old S. levaillantoides – which was actually originally and wrongly spelled levalliantoides. Food for thought. Some minor news here is that the African and South American comb ducks are now split. The name ‘Knob-billed Duck’ is nowhere to be seen, with a simple geographical substitute being used instead: American Comb Duck Sarkidiornis sylvicola; and African Comb Duck S. melanotos. Conservations will be glad to hear that the African/Eurasian Greater Flamingo Phoenicopterus roseus, is split from the American Flamingo P. ruber. The first time I birded in SE Asia I felt a Dementor-like dread when I encountered a bunch of Green Pigeons in a fruiting tree. Believe it or not but there are 31 species in the Green Pigeon genus Treron, and they all look virtually identical. Fortunately us Safricans have been saved the soul-sucking dementor’s kiss of the Treron genus, as virtually all these lookalikes are restricted to Asia. In Africa we have only one wide-ranging species…or do we? (see subsequent blog post). 351 doves and 98 nightjars later we get to the swifts. The HBW Checklist authors admit that when it came to the Apodidae problem, they used the same strategy that Harry used when fighting the Basilisk in the Chamber of Secrets: do not look directly at it. 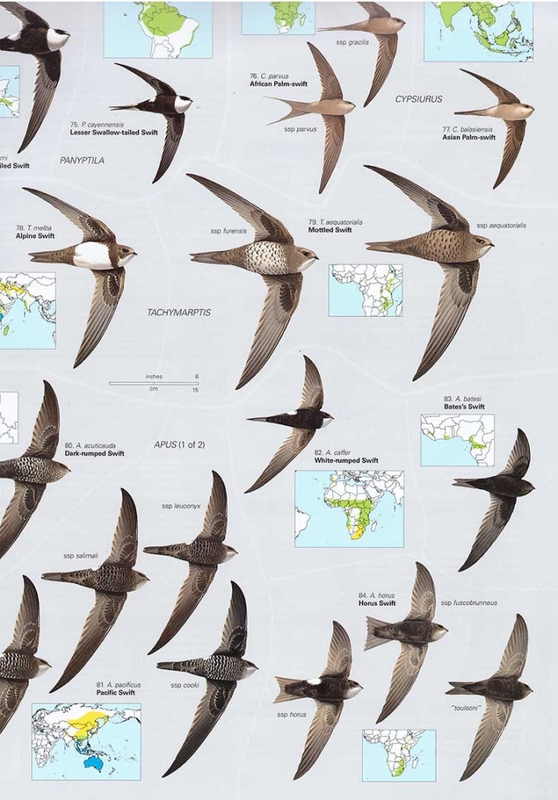 In general, the status quo was accepted for all swifts until further research becomes available, which is urgently required for the plain Apus swifts, such as African Swift A. barbatus, Madagascar Swift A. balstoni and Fernando Po Swift A. sladeniae. An interesting anecdote (also mentioned in my previous blog post) is that one study found Common Swift A. apus and Pallid Swift A. pallidus indistinguishable based on a genetic analysis. Examples such as this show that old school phenotypic classification still has value, even in our modern tech-obsessed world. ABOVE: Swifts in the genus Tachymarptis, such as the inspirational Alpine Swift, must surely rank as some of the swiftest of the swifts. Also features on this magnificent plate by my all-time favourite artist, Ian Lewington, is the African and Asian Palm-swifts, the two distinct races of Mottled Swift and, at bottom right, the white-rumped and dark-rumped forms of Horus Swift. After paging through 363 hummingbirds, of which I have personally seen zero, we get to the Cuculidae. I immediately paged to Burchell’s Coucal, or tried to at least. This species has now been merged (as a subspecies) into White-browed Coucal Centropus superciliosus. The rationalization behind this is that white-browed forms retain their a juvenile-like plumage into adulthood, while our familiar black-headed ‘Burchell’s Coucals’ have simply undergone a further moult into more adult-like plumage. However, Burchell’s do occasionally breed in their streaked, white-browed plumage, and many intermediates and hybrids are known between black-headed and white-browed variations. My feelings on this lump? I am not too surprised to be honest. Another minor change in nomenclature is worth mentioning. What older birders will remember as Green Coucal has been split into the East African Green Malkoha, and Central/West African Blue Malkoha. The HBW Checklist supports this split, but call the eastern species Whistling Yellowbill Ceuthmochares australis, and the western one Chattering Yellowbill C. aereus. The Rallidae family has been in need of a thorough taxonomic shakeup, and the HBW authors have consulted the Philosopher’s Stone to come up with some interesting changes. Firstly, the Purple Swamphen complex is still a big question mark, and two pages in the introduction chapter are dedicated to the challenges in trying to sort out this complex. 13 races are recognized in The Checklist, with mention made of at least another 17. Many of these differ markedly and consistently in dorsal colour, size and shape of the frontal shield, but the presence of geographically interposed intermediates makes ‘the difficulty in defining lines to divide the mosaic-like pattern of geographical variation’ substantial. As such, and pending further study, the whole group is lumped as one species from the Cape to Australia, namely Purple Swamphen Porphyrio porphyria. On a rather depressing note, immediately following the Purple Swamphen are listed 5 species of extinct swamphens, the little crosses next to their names a harrowing reminder of the vulnerability of island endemics. Indeed, 23 extinct rallids are mentioned in the appendix, and all of them were restricted to islands. Another point of contention is the split and name change of moorhens from the two sides of the pond. Africa and Eurasia is now home to the Common Moorhen Gallinula chloropus, while the Americas host the Common Gallinule Gallinula galeata. This name discrepancy is already confusing, but it gets worse. I always liked the idea of differentiation between 1) mainly swimming species with dark plumage, red-and-yellow bills, and white flank stripes (that South Africans call moorhens); and 2) mainly clambering species with blue and green plumage (that we call gallinules). However, the genera were apparently contradictory to the common names: moorhens in the genus Gallinula, and gallinules in the genus Porphyrio. In this case I think the Americans’ new name, Common Gallinule is actually better because it is reflected by the genus name Gallinula galeata. So painful as it may be to incorporate further name changes, I would support the following: that either all Gallinula species be called ‘moorhens’ and the name ‘gallinule’ be dropped completely; or that all Gallinula species be called ‘gallinules’ and all the Porphyrio species be called swamphens. A last little twist is that the yellow-legged Neotropical vagrant that we South Africans used to know as ‘American Purple Gallinule’ Porphyrio martinicus, is now called ‘Purple Gallinule’ (the old name of the common, big ‘Purple Swamphen’). Don’t worry if you’re lost; I haven’t been this confused since Hermione’s time-traveling stint in The Prisoner of Azkaban. Firstly, and rather sadly in my patriotic opinion, the name ‘Korhaan’ has vanished completely. What else? No major surprises. Karoo ‘Bustard’ and Ruppell’s ‘Bustard’ are still split (and are used as an example of species with parapatric ranges in the introduction). These birds are now placed in the genus Heterotetrax. Southern and Northern Black Bustards (genus Afrotis) are likewise still split. But all the White-bellied Bustards (incl. Northern, Southern/Barrow’s) are all lumped. Birders starting to worry about their rapidly decreasing lifelists (myself included) will be glad to hear that Livingstone’s, Schalow’s and Knysna turacos are still firmly split. Not unexpectedly, Northern Rockhopper Penguin Eudyptes moseleyi and Southern Rockhopper Penguin E. chrysocome are split (the latter including two races: ‘Western Rockhopper Penguin’ E. c. chrysocome; and ‘Eastern Rockhopper Penguin’ E. c. filholi, from our very own Prince Edward islands. I also experienced a pleasant reunion with an old fiend in this family – the ‘Jackass‘ Penguin. Storm-petrel classification has always been a bit, well, stormy. At this stage suffice to say that they are separated into two families: the southern Oceanitidae and the northern Hydrobatidae. Albatrosses have been shuffled around a lot in the last decade or so, but seabird-enthusiasts won’t be too shocked at the HBW Checklist’s treatment, which corresponds to most established classifications. The white-backed albatrosses are split (Wandering, Tristan, Amsterdam, Antipodean, Northern Royal, Southern Royal), as are the two sootys, the yellownoses and Black-browed/Campbell. Finally, Shy Albatross Thalassarche cauta and White-capped Albatross T. steadi are split – this means battle-stations for pelagic guides. White-capped is the more common bird in South African waters, but the very similar Shy is also present. I don’t consider myself an authority on petrels, so I won’t go into much detail, except to say that The Checklist splits the White-capped/Spectacled pair, and Scopoli’s/Cory’s, as well as Manx/Yelkouan/Balearic. I’m not going anywhere near the Little Shearwater complex today though. The changes here are mostly related to nomenclature and higher-level classifications; for example White-backed Night Heron is now placed in the genus Calherodius (previously Nycticorax), and Yellow-billed and Great Egrets are now in the heron genus Ardea (previously Egretta). I’m sure many birders are aching to see what the situation is with the complicated wider ‘Little Egret’ group. Snowy Egret Egretta thula and Little Egret E. garzetta are split, but ‘Dimorphic Egret’ has been merged into Western Reef Egret E. gularis. Also of interest, especially to world listers, is that the Afrotropical Yellow-billed Egret Ardea brachyrhyncha is now split from the Asian Intermediate Egret A. intermedia. One complex that still requires some attention – a fact admitted by the authors – is the Green-backed/Striated/Green Heron group, all taxa of which are currently lumped as Butorides striata. Finally, it seems the split between Western and Eastern Cattle Egret species was a bit premature, and these taxa are once again lumped. Stilts have given taxonomists the run-around for decades. The HBW Checklist authors took a cautionary approach by just lumping the whole bunch under Black-winged Stilt Himantopus himantopus (the New Zealand Black Stilt H. novaezelandiae excluded). There aren’t many other changes in waders. Three-banded Plovers from Africa and Madagascar are separated, as are painted-snipes from Africa+Asia and Australia. Believe it or not, but buttonquails are also waders; in this family the split between Black-rumped Turnix nanus and Hottentot Turnix hottentottus is retained. The classification of gulls is a boiling cauldron, just waiting to explode spectacularly if say, Neville Longbottom added just a single counter-clockwise stir. Despite the many, many iterations and variations proposed by various lariphiles in the last few years, the HBW checklist authors have followed a much stricter (Snape-like) view on gull taxonomy. 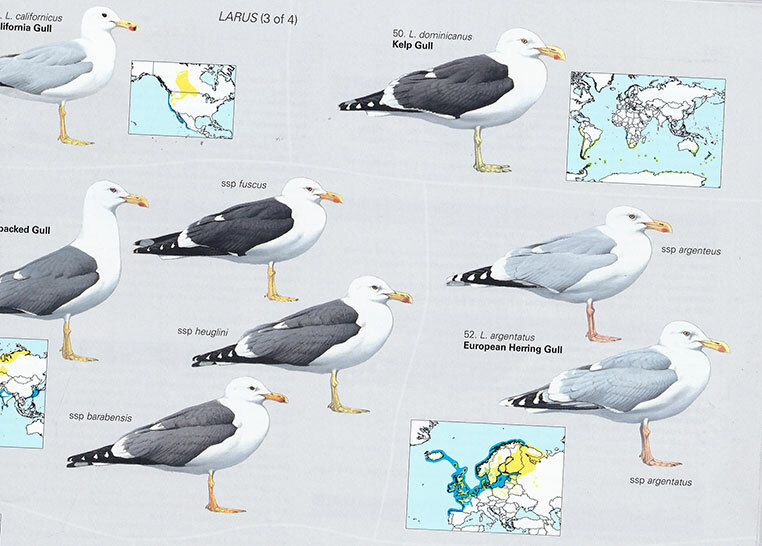 For example, all the Lesser Black-backed Gull taxa are provisionally lumped. Also, the hopeful proposal of splitting Cape/Khoisan Gull and Kelp Gull is not supported. I am relieved to see that Hartlaub’s Gull is split from the Australian Silver Gull. I see that the many newly proposed gull genera (such as Chroicocephalus for Grey-headed Gull) have been rejected in favour of the single traditional unifying genus Larus. ABOVE: A scan of plate 3 of 4 depicting the Larus gulls, by Ian Lewington. Both owl families (Tytonidae and Strigidae) were the subject of all-out taxonomic warfare in the HBW Checklist, with an incredible 26 new splits. The Barn Owl takes up almost a whole page in the book, with illustrations of 15 subspecies. Up to 46 races have been recognized in this taxon, but pending further research they are currently lumped as ‘Common Barn Owl’ Tyto alba. Our African Grass-owl T. capensis remains split from the Asian/Australian Eastern Grass-owl T. longimembris. In the typical owls there aren’t really any changes that affect us in southern Africa. Firstly, it was recently recognized that typical raptors and falcons are not closely related, with the latter being more closely allied with parrots (makes sense if you think about it hey?). 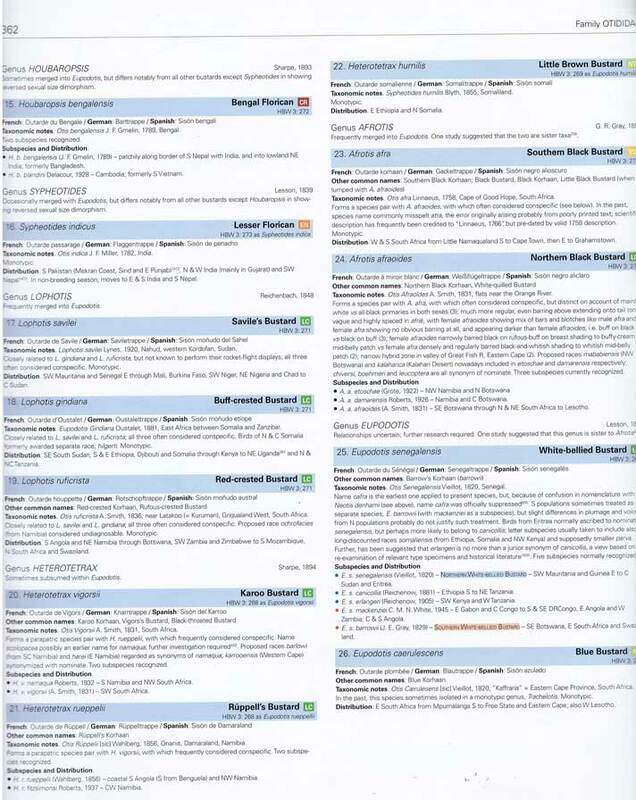 The HBW Checklist authors consequently took the rather courageous decision to place these two families in completely different parts of the book. The globally occurring Osprey Pandion haliaetus, which is in its own family, Pandionidae, is lumped as one species, despite proposals of splitting off Eastern birds. 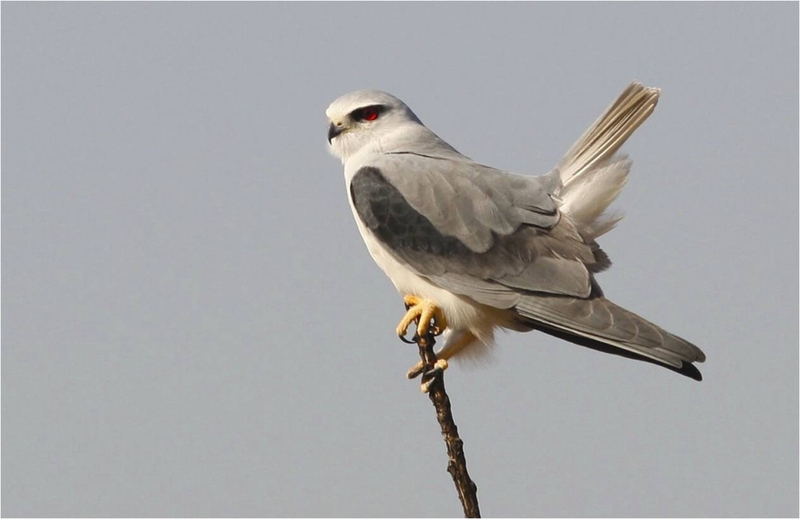 The small Elanus kites have been sorted out, with African/Eurasian birds now carrying the name Black-winged Kite E. caeruleus, while Australian birds are known as Black-shouldered Kite E. axillaris. So careful with throwing that familiar B-S-K abbreviation around birders! People might think you’ve found a vagrant from across the Indian Ocean. Speaking of kites, a consensus on the whole Yellow-billed/Black Kite saga would be wonderful. However, this does not appear to be an option at the moment. The Checklist has waved its magic wand to lump all these taxa under Black Kite Milvus migrans; they do mention that yellow-billed populations belonging to the races parasiticus and aegyptius form a separate clade (i.e. ‘Yellow-billed Kite’) but conclude that further research is needed before these can be differentiated at species-level. 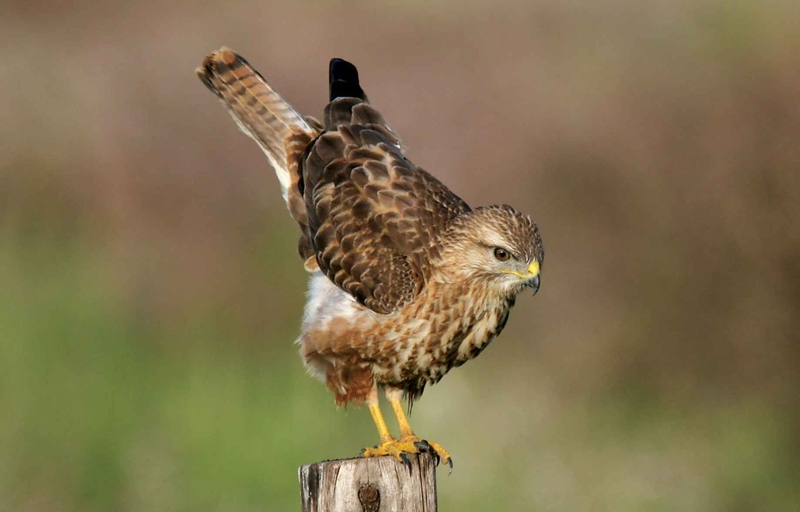 Taxonomic papers dealing with the Buteo buzzards have more crossed-out and scribbled notes that Harry Potter’s Advanced Potions Making textbook. The HWB Checklist authors elected to lump ‘Steppe Buzzard’ (vulpinus) as a subspecies under Eurasian Buzzard B. buteo. On the other hand, our Forest Buzzard B. trizonatus is split from the East African Mountain Buzzard B. oreophilus. 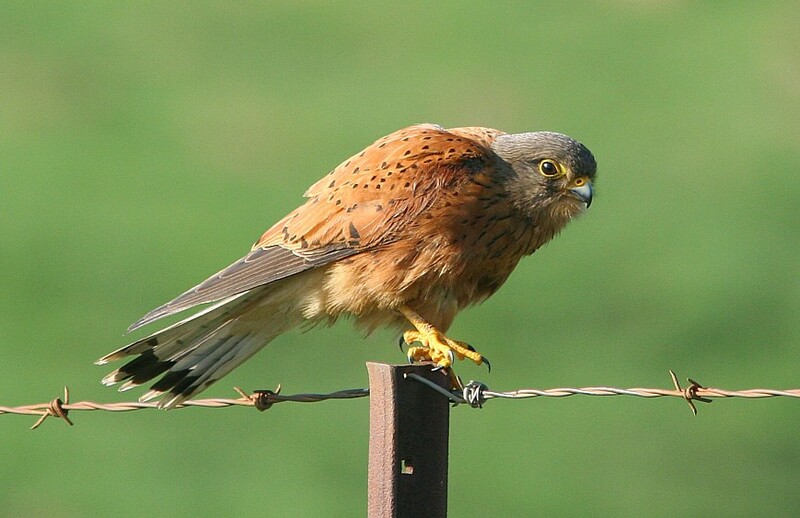 In terms of the Falconidae (sensu stricto), the only notable change is that ‘Rock Kestrel’ is now merely a subspecies under Common Kestrel, i.e. Falco tinnunculus rupicolus. ABOVE: And this is the vulpinus subspecies of Common Buzzard, photographed in South Africa (by Kevin Ravno). ABOVE: While this is a Common Kestrel (rupicolus ssp), photographed in South Africa (by Phil Penlington). Namibians will be glad to hear that their Damara Hornbill Tockus damarensis is the only ‘Red-billed Hornbill’ taxon to have met the criteria for a species-level split. All the other redbills are lumped under one wide-ranging species. A bit of a shocker is the lumping of African Hoopoe (previously Upupa africana) with Common/Eurasian Hoopoe U. epops. This is based partly on their very similar calls (clearly different in the Madagascar Hoopoe though) and intermediate forms that bridge the gap between the large pale Eurasian birds and the smaller, vividly marked African ones. In respect to the Damara Hornbill I said that Namibians can remain proud of their near-endemic split; the opposite is true of the Violet Woodhoopoe Phoeniculus damarensis, which is now lumped with P. granti of Kenya. However, I do think that a full review of all the woodhoopoes is required, as there appears to be integration where their ranges meet. This is another family that has been drastically tinkered with (if you’ll excuse the bad Piciformes pun). 39 new splits are included in The Checklist, although these do not affect us in southern Africa. Birders who have worked hard to find Speckle-throated Woodpecker in Mozambique will be glad to hear that it is split from Bennett’s, although it is called by the name Reichenow’s Woodpecker Campethera scriptoricauda. So how many woodpeckers are there in the world? Apparently an impressive 254 species. The big question here, with huge conservation implications, is of course the validity of the South African endemic Cape Parrot Poicephalus robustus. This forest-dwelling parrot is differentiated from the savanna-dwelling Grey-headed/Brown-necked Parrot P. suahelicus/fuscicollis. However, colour differences between the two are variable, and ecological specialization also appears to be minor (e.g. in Tanzania ‘Grey-headed Parrots’ also occur in Podocarpus forests). As such, The Checklist has said Avada Kedavra to the Cape Parrot, and now lumps all these taxa as one species, the Brown-necked Parrot, P. robustus. That is not to say that commendable conservation efforts focused on the South African subspecies are not important! The checklist authors agree (see page 41). That’s about that…until Volume 2 arrives. Get some more previews, and check out payment options for the book on Lynx’s website. Perhaps you’re experiencing some disheartening emotions after reading about all these lumps – chances are that you may have lost, or will soon lose, a few ticks. I know how traumatizing it can be to implement a new taxonomic review. Perhaps you’re feeling some anguish (‘I’ll have to re-do my whole bloody world list, it’s going to take weeks’); or confusion (‘What do you mean Black and Yellow-billed Kites are lumped? That’s insanity! ), or despair (‘My world list was on 3000, now I’m back on 2800 and something’). I sympathize, and I’ll leave you with some out-of-context, philosophical quotes from Albus Dumbledore, beloved Hogwarts Headmaster. I don’t think he was talking taxonomy, but I still think his words are applicable. “The truth. It is a beautiful and terrible thing, and should therefore be treated with caution”.